Prices for the shiny commodity have tumbled nearly $200 in a month, but its future is still uncertain. What "Issue #1" topic should be the priority of the new President? NEW YORK (CNNMoney.com) -- A rebounding dollar, sinking commodity prices and a seasonal jewelry sales lull have sent gold prices into a virtual nosedive in the past month. The precious metal - the go-to commodity when investors fear that the sky is falling - has dropped $190, or 20%, since July 15, sinking below the $800 mark on Friday for the first time since December. Gold has risen in only two sessions in the past five weeks, including Monday, when it settled up $13.70 to $799.70. Gold has fallen as the dollar soared in recent weeks to about its highest point against the euro since February. Other commodities have also plummeted in the past month. Crude oil, for instance, has lost more than $34, or 23%, since setting a record on July 11. Corn prices have dropped about $3 after rising to about $8 a bushel in early July. Since investors tend to use gold as a hedge against rising prices, the commodity's huge decline may be a sign that inflation fears are abating. "The irrational exuberance that we saw earlier in the year has come out of this [gold] market," said Jon Nadler, a precious metals analyst for Kitco. "The focus on the dollar has real legs, and there is a risk of further long liquidation of gold prices." 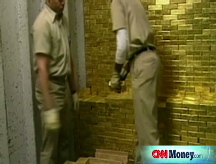 Nadler believes gold will come down to the low-to-mid $700 range and stabilize around $650 in 2009. If oil comes down well below $100, he said gold could even sink to the $600 range. "If the commodity bubble hasn't truly burst, and trends change again, even then we have to look at a year of pause and breath-catching before gold can continue higher," said Nadler. "Money is coming out of this sector; the shift in asset allocation is perceptible." But some say not to celebrate the end of rising inflation and high-priced commodities just yet, as gold may be due for a rebound back to the record levels it saw earlier in 2008. "Whether this particular rise Monday is the beginning of a rebound or not, ultimately, gold's going to go much higher because it's greatly oversold at the moment," said Jeffrey Nichols, managing director of American Precious Metals Advisors. One of the reasons gold may begin to bounce back is that demand for gold is traditionally at its weakest levels in July and August as jewelry sales sink during the summer months. But demand tends to pick up again in late August and September as shopping season takes off again: Westerners start to buy gold jewelry for the winter holiday season, and Indians - the largest gold consumers - begin buy up the shiny metal for the Diwali festival season. "The metal is especially vulnerable during the summer months to other negative factors and forces," said Nichols. "But there was a great deal of responsiveness to lower price levels in the last week, so the seasonal pickup may already be happening now." Furthermore, continued upside risks to inflation are high. Just ask the Federal Reserve, which has not lowered its key interest rate since April, despite continued weakness in the U.S. economy. Though the dollar has risen lately, much of that boost has been due to growing weakness in European economies. If rising prices fears continue to mount, that could be fortuitous to a gold comeback. "With the right confluence of economic and geopolitical developments we could see gold as high as $1,500 or even $2,000 an ounce in the next few years," said Nichols. Gold set a record of $1033.90 in March, though the $847 level that gold hit in 1980 would be worth $2,170 in today's money, more than double March's record.